Absolute Adventures — Go like the wind, literally! If you're looking for an activity to do while you're staying in Jersey and you don't want to get wet, we may have the perfect alternative for you! Located in the middle of St. Ouens Beach, opposite Big Vern’s is where this activity takes place! 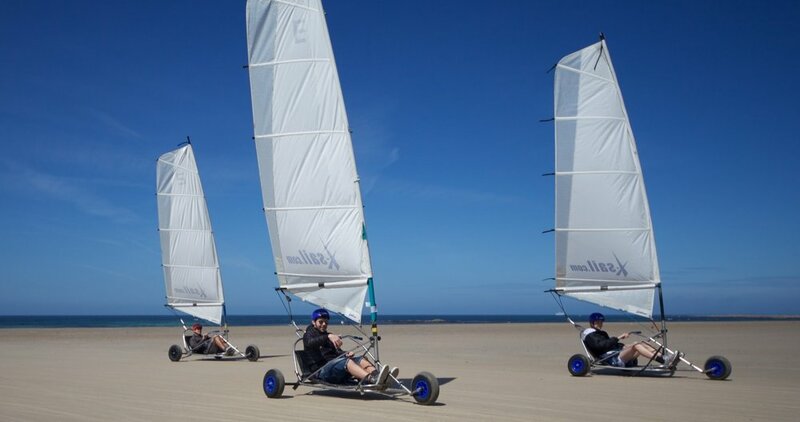 Do you want to feel the wind in your hair as you zoom up and down the beach in one of our Blokarts? Blokarting is a very high adrenalin activity and a lot like go-karting, but without the emissions! The karts are powered by the wind which propels you around our course at speeds up to 30kmph! (occasionally they’re also powered by our instructors if you’re struggling to get going!). A great activity for competitive families and friends (or even corporate team building), Blokarting involves a lot of skill and concentration to use the wind to your advantage and overtake your peers. Give us a call to find out our next availability, and give it a try for yourself! Unfortunately with an activity such as Blokarting where we depend on the weather and tides, they don’t always provide for us, give us a call and we’ll tell you what they're doing! Click this link to be taken to the booking page, alternatively give us a call on 07829 88 11 11.